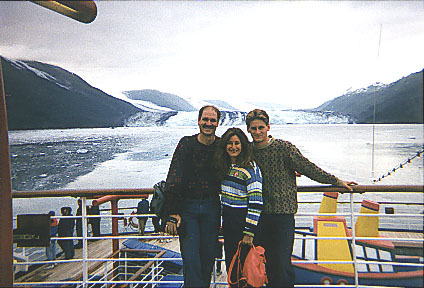 Well, we are back from our trip to Alaska, we were gone from June 29th through July 9th, 1997. We did a four day land package then went on to a seven day cruise. We started our trip by flying from Detroit to Cincinnati, then to Salt Lake City, Utah and on to Anchorage, Alaska. We flew Delta airlines going there and had less than an hour layover on our two stops. The flight was fine, I just wish they had more leg room. We left Detroit at 7:00 Sunday morning and arrived in Anchorage at 2:30 in the afternoon (6:30 our time). The package we booked was through Ship and Shore (800) 925-7447. They picked us up at the airport and took us to our hotel, the Inlet Tower Suites. The first day we were on our own and walked to downtown Anchorage which was about a mile away and checked out some of the restaurants. We had dinner at a microbrewery and went to bed at 9:00 (1:00 a.m. Eastern time). I woke at 3:00 in the morning Anchorage time and it was still only dusk looking. Day two: a bus picked us up at the hotel to take us to the Anchorage Zoo & a tour of downtown Anchorage. 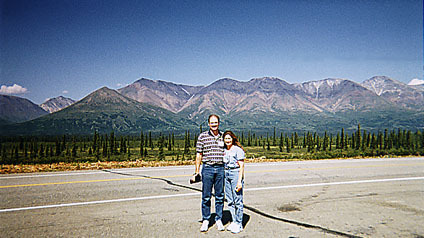 In the afternnoon travelled by bus to Denali National Park. The bus ride took 4 1/2 hours and the driver talked about the history of Alaska and pointed out points of interest along the way. We saw Mt. McKinley along the way (20,370 ft high). Once near Denali we signed up for whitewater rafting and since our bus was running a little behind schedule we went right to the river to catch the last rafting tour of the day. 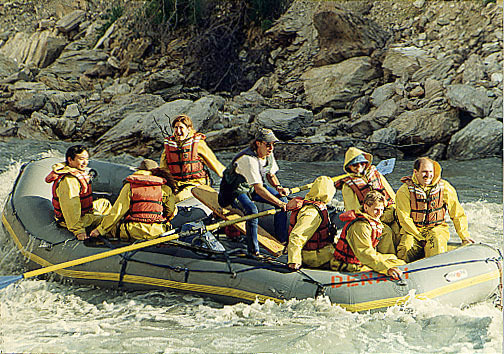 It was a blast and the water was very cold (snow melting off the mountains) but it was safe and the guide did all the steering. Then we went to our hotel the Windsong Lodge and changed our cloths that were wet. We had dinner at a pizza place right next to the hotel and then crashed for the night. Day three: We went to the park for a tour lead by the park service. They put you on school buses and drove you up a mountain explaining about the parks wildlife and tundra. We did see a moose in the distance and were able to see Mt. McKinley from the park. The park rangers put on a skit at a log cabin in the woods, talking about how the park was started and how it developed. The tour was ok but we didn't see as much as I expected as far as animals. After the tour we had lunch at the park restaurant and got back on the bus to go back to Anchorage. The long ride back was fairly boring, but when we got back we went downtown and they were having a party in the park for the Mayor that had been re-elected and they had free food and entertainment. Day four: We boarded a bus at the convention center to go to Seward and board our cruise ship. We had a very funny driver who made the three hour drive go fast. Along the way we saw a moose, bald eagles and dall sheep. We arrived at about 5:00, just in time for dinner. We spent the rest of the day exploring the ship. Day five: North to South cruise on the Carnival Tropicale. Sailing through College Fjord and past Harvard (7am) and Columbia Glaciers (11:30am). Then our first stop was in Valdez (2:30pm - 6:30pm). It was a very small town and as far as I am concerned a wasted stop. At every port there were excursions you could go on that the cruise line set up (you can set your own up, as we did). Of course, these all cost extra and I heard that some people went to see the pipe line (they were disappointed), while others went on a rafting ride (they had fun). Then back on the boat and sailing again. The ship had a casino, sun decks, pools (they only filled one and the weather wasn't the warmest), inside sitting by windows, entertainment every night, and food, food, food. Pizza was available 24 hours a day, and breadfast, lunch and dinner in the main dinning room was five or six course meals. 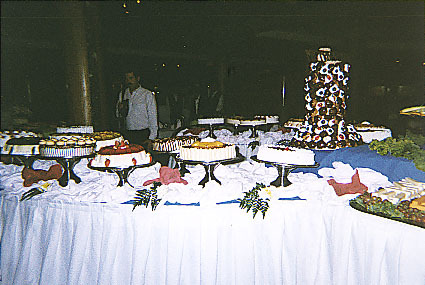 Oh, there also was a midnight buffet every night, with deserts and more food if you were still hungry. Drinks were extra and remember you need to tip your waiter, busboy and room steward at the end of the cruise. 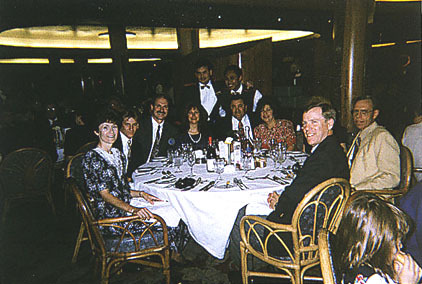 Our cruise had two formal nights, but if you didn't want to dress up there was another dining area called the boiler room you could eat at. Day six: Fourth of July. 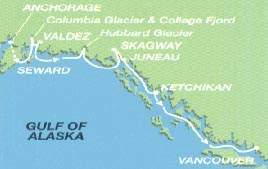 Morning sailing in Yakutat Bay & afternoon viewing of Hubbard Glacier. We were not in port, so we were not able to see any fireworks. The sights were great and the cruise very relaxing. You do have to set your own pace and not do everything that's available or your wear yourself out. This was our first formal night. Day seven: Arrival in Skagway at 7am and departing at 11pm. We had reserved a rental car in advance and went for our own tour. We went to some waterfalls and then to a cemetary that had 50 people buried in an avalanche about 1oo years ago. From there we went into Canada, through the mountains. The scenery was great but by the middle of the day we were wearing down and headed back to the ship for dinner. Our last effort there was to walk through the downtown shops and hunt for the elusive souveniers. Day eight: Arrival in Juneau at about 7am and departure at 4pm. Juneau was known for gold and is now the Capital (though some want to change it because it is not very accessible). Well, we had beautiful weather up to now, but here it was raining. We had booked a helicopter (Coastal Helicopters: www.AlaskaOne.com/coastal, (907) 789-5600) in advance to land on Herbert Glacier (past Mendenhall Glacier) and decided to still try it. Lucky we did, it was great. We lucked into good visibility and no one else on the glacier. We later learned the tours that were booked through the ship were cancelled due to weather. 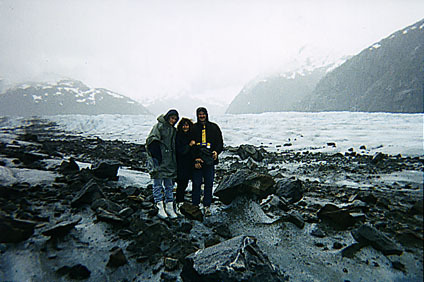 It was a spectacular sight, with streams flowing through the blue ice and mountains all around. Day nine: Arrival in Ketchikan at 10am and departure at 6pm. Ketchikan was known for its salmon cammeries and Bordellos. We had booked a sea plane (Island wings air service (907) 225-2444) here to go to Misty Fjords (views of thousand foot waterfalls, majestic mountains, peaceful fjords) but due to rain and high winds it was cancelled. We ended up exploring all the shops in town and that kept us busy all day. Day ten: Cruising the Inside Passage. All day cruising by small island on both sides. The scenery was great again. We did see whales again from the distance. Day eleven: Arriving in Vancouver at 8am. Off to the airport to come home.